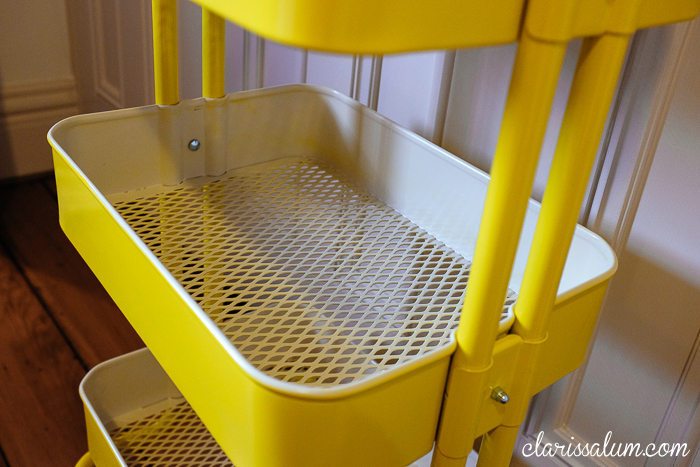 I had planned to paint the IKEA Raskog cart yellow even before purchasing the cart! Its been sitting unassembled, in the box for the past month… just waiting for me to get around to giving it a new look. Why yellow? 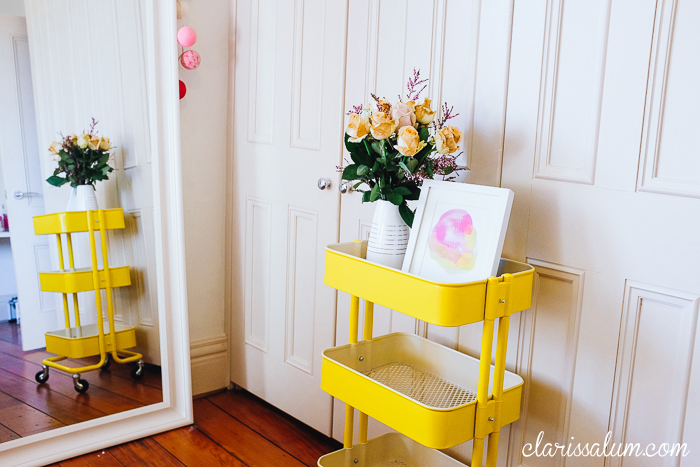 I do like the popular turquoise colour but does not fit into my bedroom’s colour theme (white + coral/pink) and cream (the original colour of my cart) would look too washed out in my room. 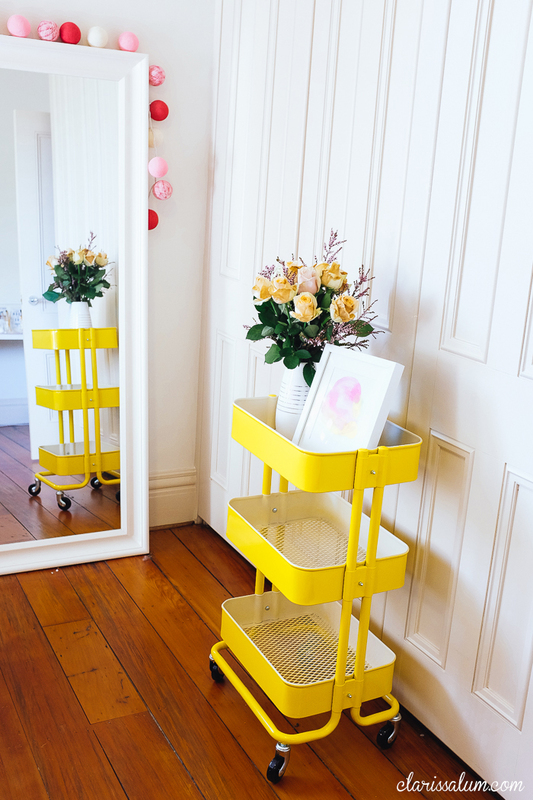 I wanted to make this cute and practical cart pop in my room, so Yellow it is! 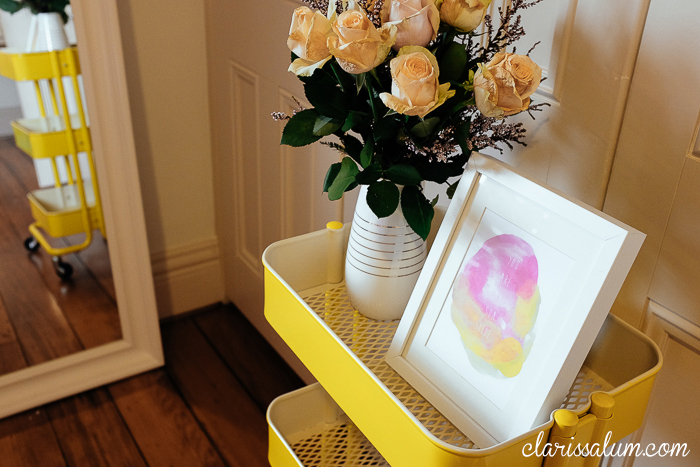 It was scary not know how it will turn out as I’ve trawled the internet trying to see if anyone else has made their yellow and have not come across any.. so thankfully the imagination came to reality pretty well. 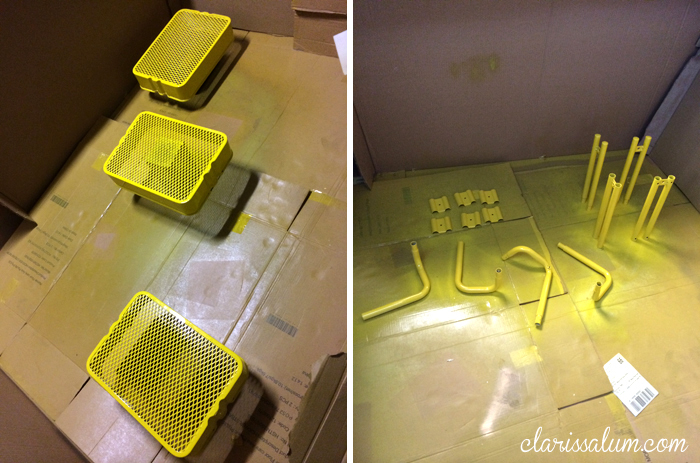 Before I continue, a hugeeeee credit to Alfred the boyfriend for doing the tricky part of spray painting it and getting a pretty good finish as well as assembling it. To think I wanted to do it myself all this time! Would’ve turned out terribly blotchy with my (lack-of) spray painting skills. 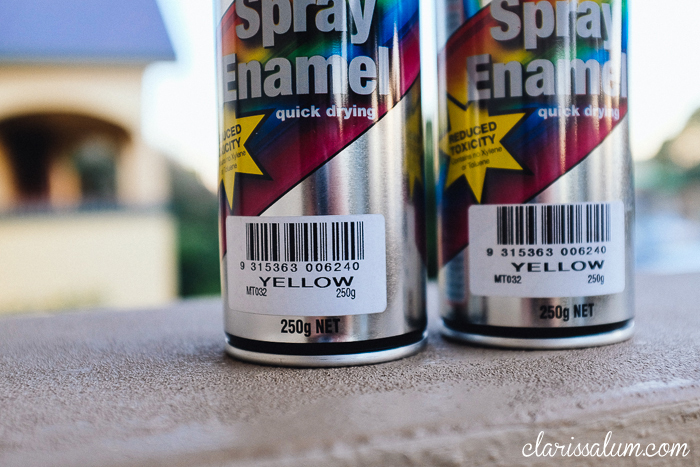 Apparently Bunnings didn’t have a great selection of colours to choose from, so I ended up getting the spray paints from Repco, on sale for about $2~ from memory, even though the rrp isn’t that much more. It made for a cheap D.I.Y project. 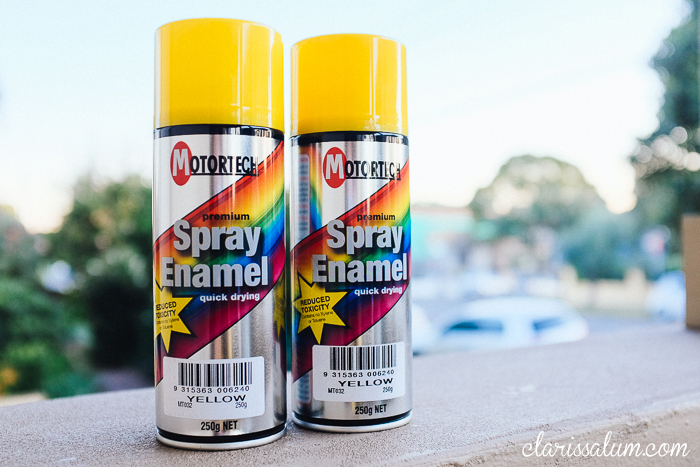 2 cans of spray enamel, did not get a clear coat because I wasn’t after a glossy finish. 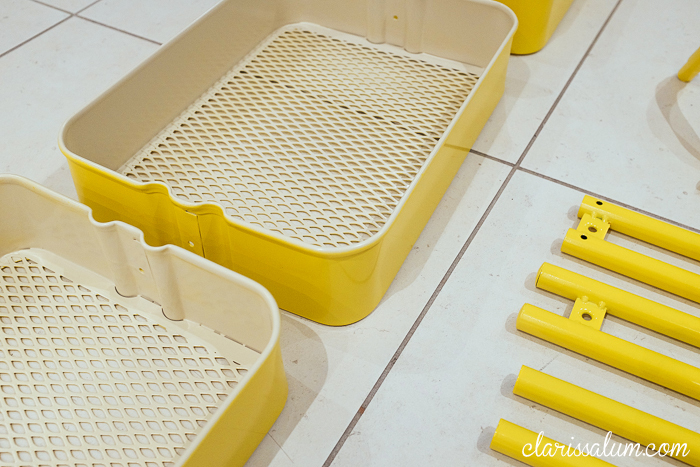 As my cart was originally cream, it was easy to work with, not having to worry about the base colour too visible if there were any mistakes. First off, give it a light sand on all parts, Alfred had to build a spraying booth with cardboard in the shed just to get a controlled environment for spraying. 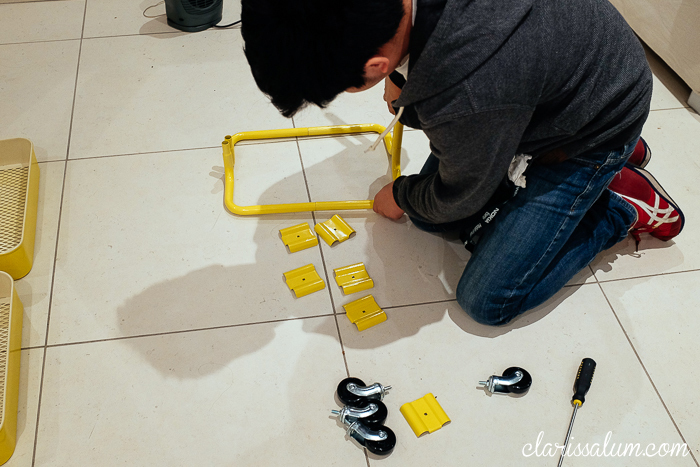 We didn’t have anything to hang the parts off, so that would’ve made it much easier to get an even coverage and be able to do it in one go. Still turned out pretty well the way we sprayed it after 2 coats. That’s it! Really loving the extra colour I’ve added to my room. Clearly I have yet to load it with all my Project Life and crafting/packaging supplies, need to go shopping for storage stuff now. So will update on the loaded Raskog later on. If you have any must have accessories for the Raskog, please leave a comment below! This trolly looks absolutely fantastic. I love the contrast between the yellow and cream. Well done. Love this idea! 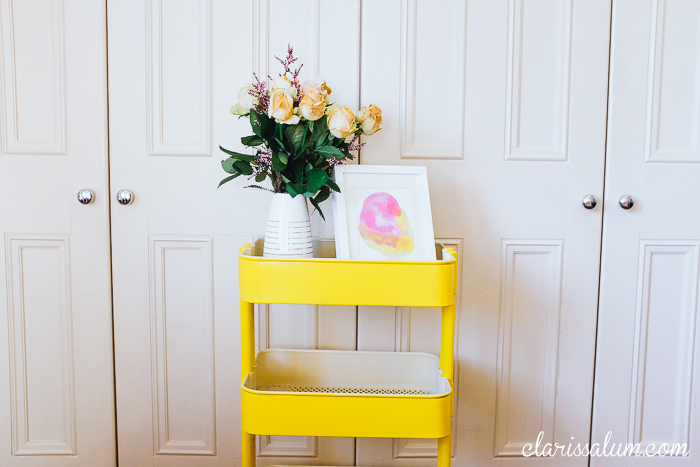 The color is so vibrant and sunny. 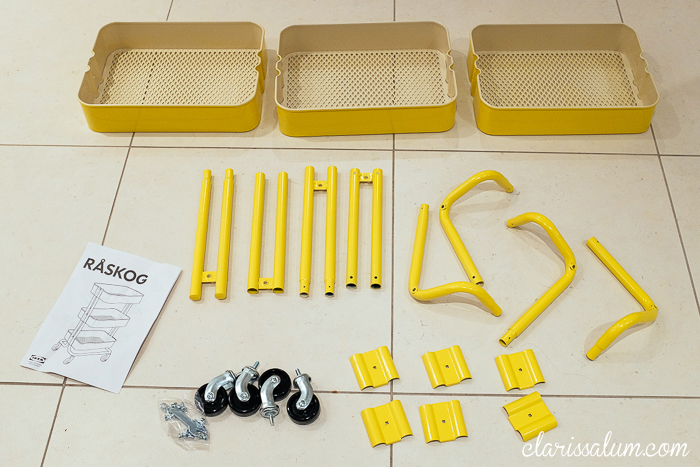 You have definitely inspired me to paint my Raskog yellow…will hopefully be doing it today! As suggested I am lining the edges with painters tape and taping down newspaper in the bin section to avoid overspray. Thanks! I find myself looking at this post regularly because it’s so great. 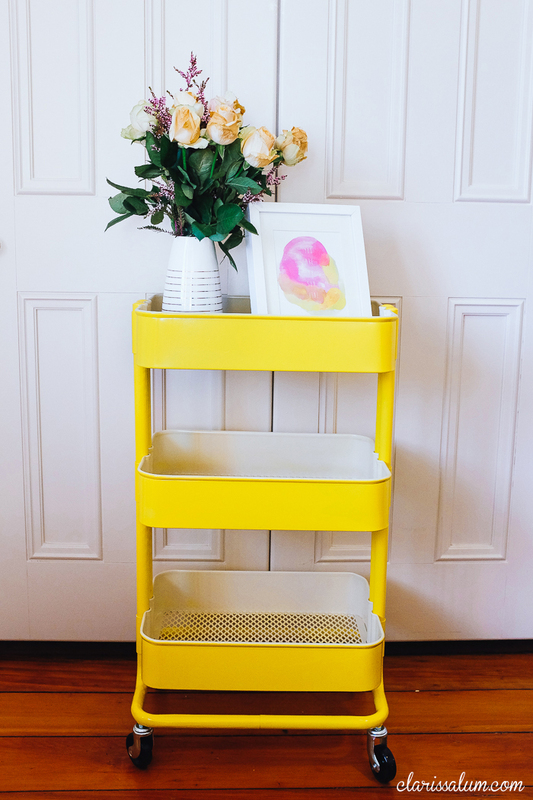 I want to do the same with my cart, but I am wondering how neat the line between the yellow and cream is? Say, if I were to do bright red, it might be less forgiving. Oh man, I’m glad I found this! My black cart is so drab, but it’s all they had and I really needed it for organization. Time to make it shine!